I love decorating my Christmas tree and I often get lots of compliments on it! 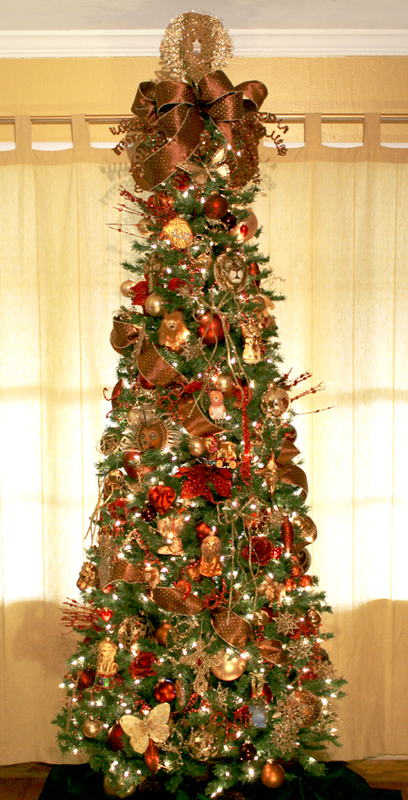 I think one of the things that makes my tree look so "put together" is its crown-- the tippy top. A tree just isn't a Christmas tree without a topper. My tree is very narrow and my ceilings are pretty low, so I can't make a fabulously grand crown with fruit and ornaments and giant angels, but I can still dress it up-- and you can, too. You don't need to be a fancy designer-- just a cool chickadee with a couple designer tricks up your sleeve. 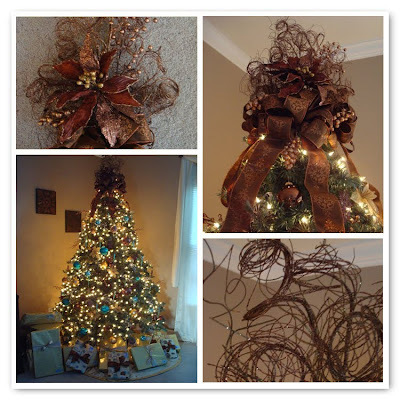 I've never taken decorating classes or anything, I just pick up ideas whenever I see a beautiful tree at a department store, in a magazine or in a catalog and I have a whole file of clippings to prove it! So, I thought I'd share an easy way to fancify your tree top featuring an awesome trick that I came up with on my very own. Enjoy! Once you've chosen your theme and color palette, shop for pretty wired ribbon about 3" wide (think grand!) and some glittery floral picks, branches or anything you can add that will coordinate with your trimmings. The best "extras" have long stems that you can just stick into the tree without having to wire them on. 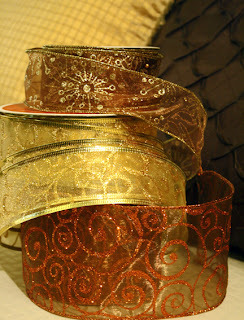 Buy 4 or 5 spools of ribbon-- it's always better to have extra than not enough. And you probably don't want to have to run to the store mid-trimming only to find out it has sold out of your ribbon! To make a topper like mine, you need 3 or 4 large bows. I make multiple-loop bows with 4 or 6 loops-- depending on the thickness and width of the ribbon. These bows are about 10" wide with 10" tails cut on a diagonal. I prefer shorter tails that don't hang all the way down the tree, but just enough to curl nicely at the top. That way there's more room to show off ornaments. If you need instructions on making multiple-loop bows, check out this Container Store tutorial-- that's basically how I make mine, but I don't do the little loop at the beginning. The center of the bow won't show anyway so there's no need to hide the wire. If you look closely at that second picture above, all I do is pinch the center and wrap it tightly with wire. Shh, here's the best part-- my super-secret McGuiver-style tree-trimming trick. 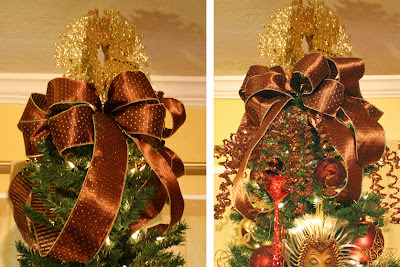 This technique allows you to attach all the bows to the tree top while keeping the top branch free for Grandma's favorite angel topper. All you need is an inexpensive embroidery hoop and some wire, pipe cleaners or twist ties. Use the wire to attach each bow to the hoop, then fluff up the bows. Taddah! You've just created a gorgeous bow topper that you can reuse year after year! Now, all you have to do is place the hoop around the tippy top and let it sit on the top branches. 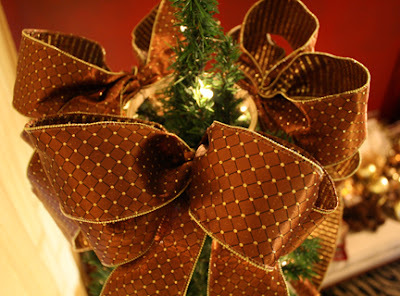 Step back, walk around the tree and adjust the hoop so it sits properly and doesn't lean to one side. The top branch is now free to add your own tree topper! Step 5: Dress the Tree! Along with the giant bows, I try to find some fun sparkly extras to stick up at the top to draw the eye upward. I found these super cool picks that have curly wire covered in brown sequins. They came as tightly wound coils, but you just stretch them to make cute boingy spirals. You can either stuff your picks into the bows so they stick up, or under the bow so they hang down. Since my sequined picks were bendable, they looked best cascading under the bow. Finally, you can add your traditional tree topper to the tippy top like I mentioned before, or just fluff up the bows to hide the top branch. Voila! You have a beautimous tree top and all your friends will think you had it done professionally! When you are ready to store your decorations, find a box that is big enough to hold your bow hoop without crushing it and use scrunched up tissue paper inside each loop to keep the ribbon from creasing. You'll be glad you did next year! 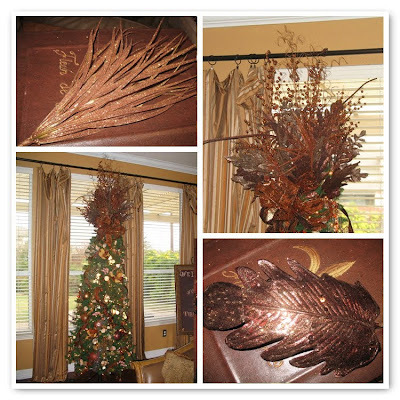 Check out these fabulous tree tops by truly talented ladies. Thanks for allowing me to share your pics, chickadees! I love the idea of using the hoop...I've never done it that way because I never put a traditional thing (angel etc.) on top. I switched to silver and gold this year, hope you take a moment to look at my tree post! I put it up last week. Thanks for mention in your post! Thanks! I invented it all by myself! Of course, they say no ideas are new ideas. But I say good ideas are always welcome. I'm going now to check out your tree! This is beautiful, Melissa! Thanks for posting! Beautiful! The embroidery hoop is genius! 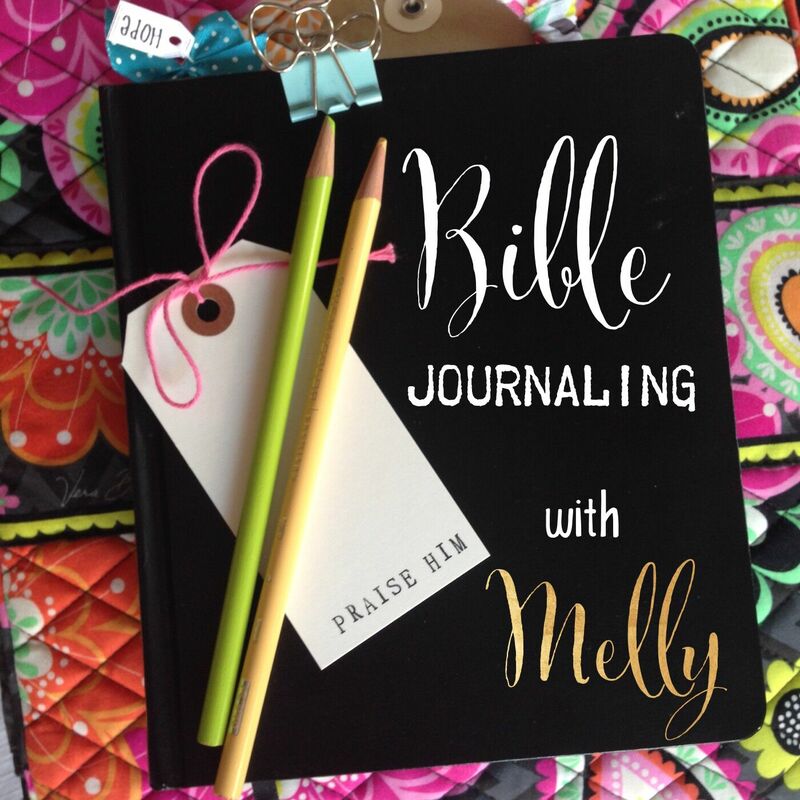 Love how creative you are; keep the ideas coming!